Looking for an all-in-one reference for your medical practice? Allow me to suggest Medscape Mobile. The apps and website feature content reviewed by over 7,000 peer-reviewers, and it is updated frequently so you needn’t worry about pulling info that is out-of-date. 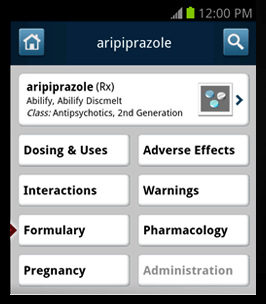 Medscape’s mobile apps feature a smorgasbord of reference tools. • Save and Share feature for articles, meds, or whatever you find that is worth passing on to another provider. There is an option to download reference materials for offline use, which is of great benefit when you work in areas with spotty coverage or worse (gah! ), NO coverage (ugh!). Sorry, but I just can’t see recommending a Windows Phone or Blackberry for public safety use. There are far too many good apps like this one that aren’t and probably won’t ever be available on these platforms. That’s a shame too, because I like to play around on my Windows Phone and it is evolving into a decent smartphone platform. You can also access the app’s information from the website. Medscape is part of the WebMD family of brands, which also includes the popular WebMD (which has its own apps, located at http://www.webmd.com/mobile, more geared to the lay-person than the professional), plus eMedicineHealth and MedicineNet. It is priced to fit even the struggling EMT scholar’s budget. It’s free. No subscription is necessary. Just register for an account when you download the app or visit their website. I also get a couple of newsletters sent to my inbox. It’s amazing how often I have found an article from the newsletter and it points right to a subject that is drawing attention in EMS or to a patient encounter I recently had. If you are in EMS, critical care, or primary care, this is one tool you don’t want to pass up on getting your hands on. Note: This is an unsolicited app review. No compensation was provided by Medscape for the content of this post.